Gastric Bypass is a surgical procedure used in the treatment of obesity. Obesity is a serious, chronic disease that is growing worldwide concern affecting the healt of millions of peole. Obesity is defined as an exessively high amount of body fat in relation to learn body mass resulting from caloric intake that exeeds energy usage. Obesity is the second leading cause of preventable death following smoking. Compared to peole of normal weight, obese peole have a 50 – 100% increased risk of dying prematurely. The most common gastric bypass surgery is Roux -en-Y. This operation is done laparoscopically (keyhole surgery), exept in case of a complication. In this surgery, the surgeon creates a small stomach pouch by stapling the upper part of the stomach (15 – 30 ml). A new opening from this pouch is created as well. The small intestine is then cut into two sections. 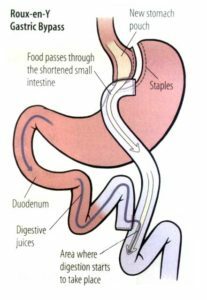 The lower section of intestine is attached to the opening in the stomach pouch creating what is referred to as the „roux limb“. The upper section of the small intestine which carries digestive juices from the remaining portion of the roux limb. The roux limb enables food to bypass the lower stomach, duodenum, and a portion of the small intestine. The risk of complications is lower at centers that perform more than 100 weight loss surgeries per year. And, when performed by a highly experienced surgeon, deaths in the month following gastric bypass surgery are rare: about 0.2% to 0.5%.